After the last monster post, this one is going to be slightly shorter. Everyone breathes a sigh of relief!! 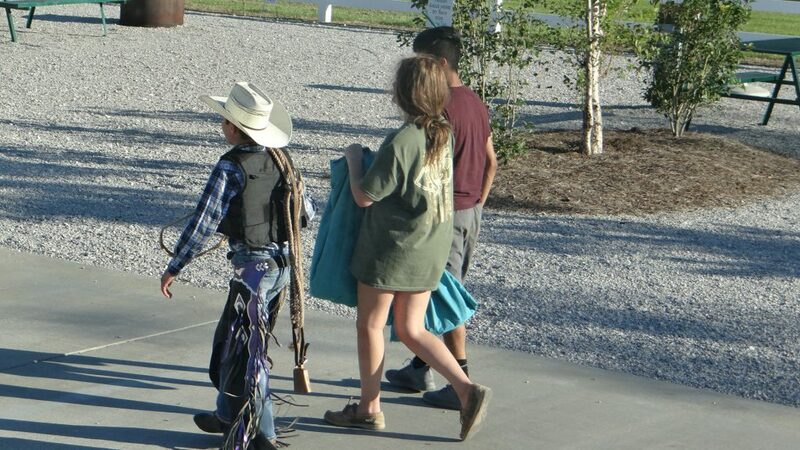 We left Amarillo and after an overnight stop arrived in Oklahoma City. 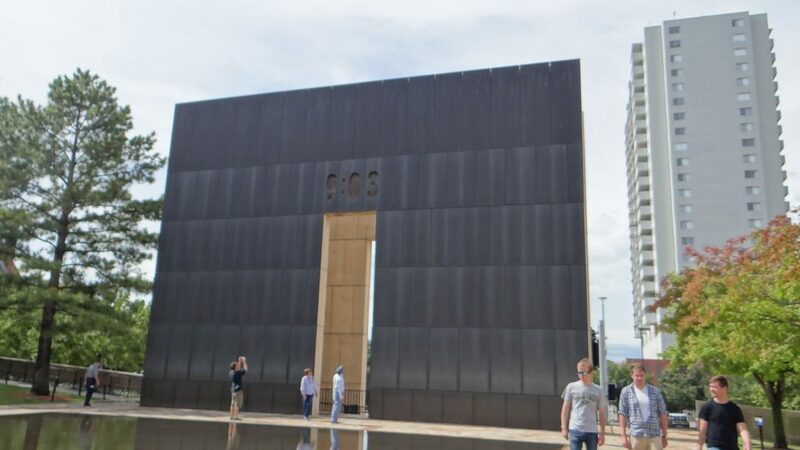 I am sure it has many attractions but Oklahoma city is remembered mainly for the horrific truck bomb that exploded outside the Alfred P. Murrah Federal Building killing 168 people and injuring several hundred more. It was so powerful a bomb that over 300 other buildings were either destroyed or damaged. 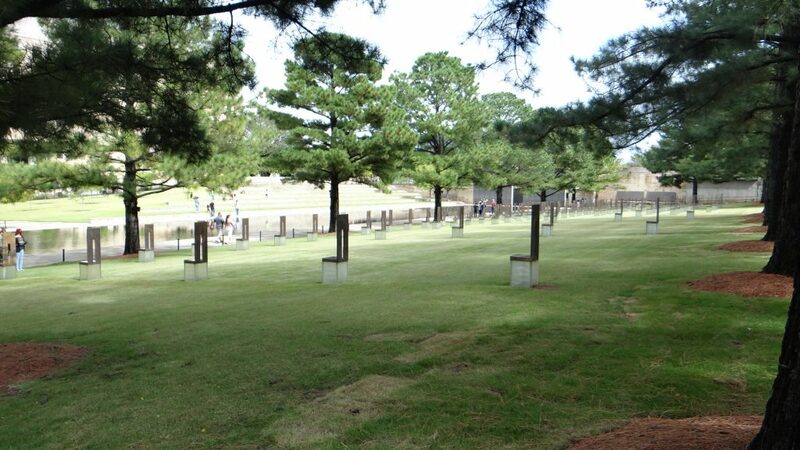 Where the building stood is now a memorial garden. The main memorial showing the time one minute after the bomb went off. 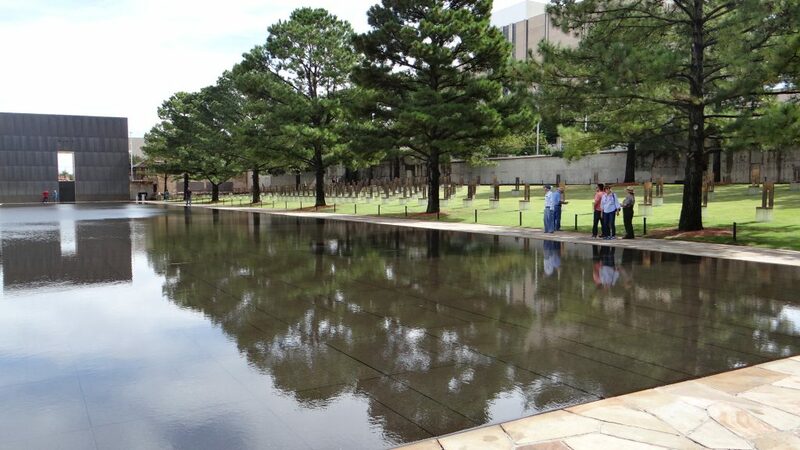 The main area where the building stood is a reflection pond. 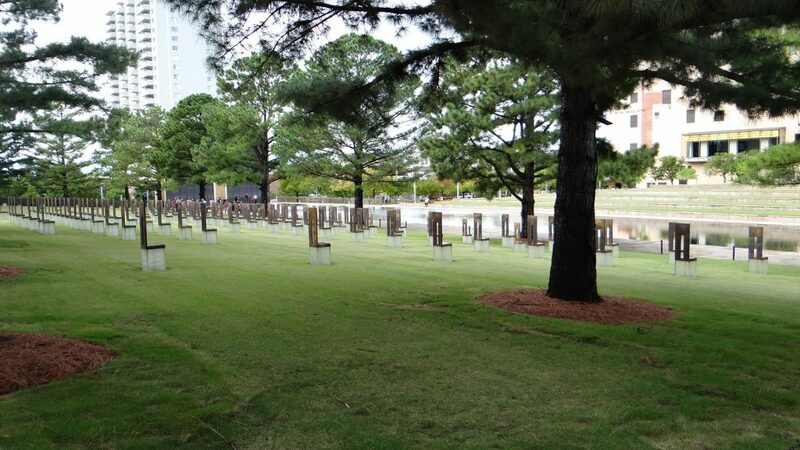 Each seat commemorates a person killed. 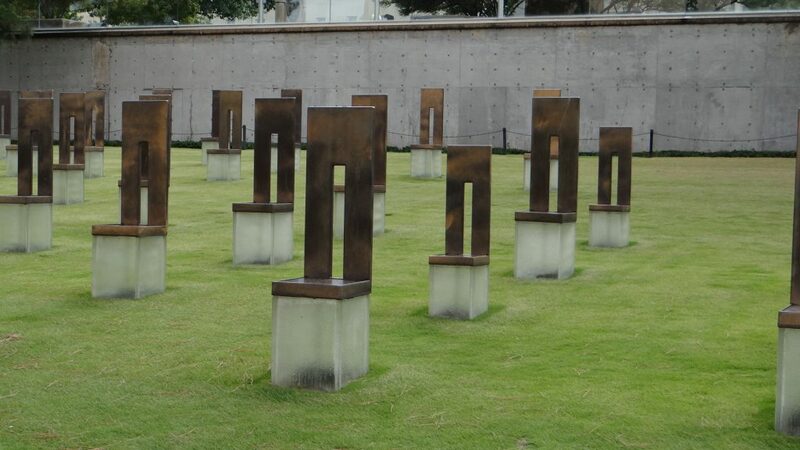 The smaller seats commemorate the children killed. 19 children were killed, mainly from a day care centre that was run for employees. 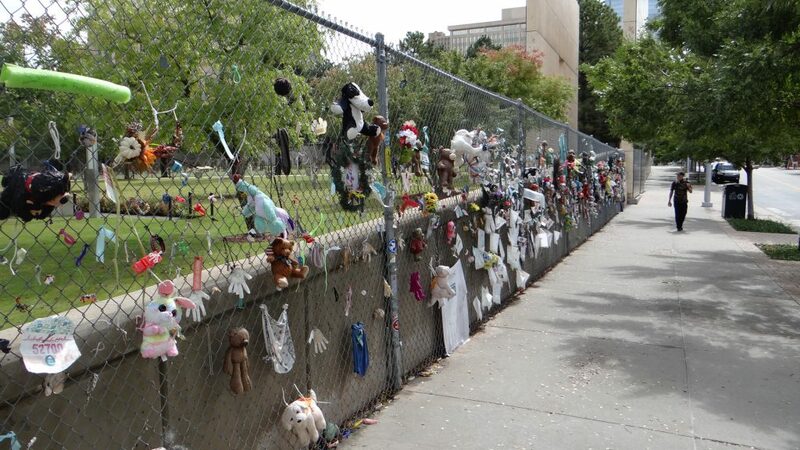 Remembrance items hung on the fence. 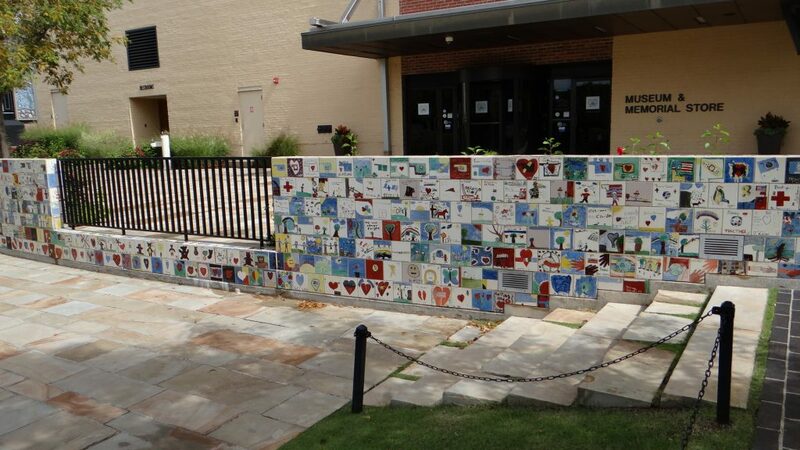 Remembrance tiles from children all over America. Other views of the garden. We then moved on to Texarkana, which is a town right on the Texas / Arkansas border. If you drive down the Main Street one half is in Texas and the other in Arkansas, which must be interesting comparing taxes etc. !! 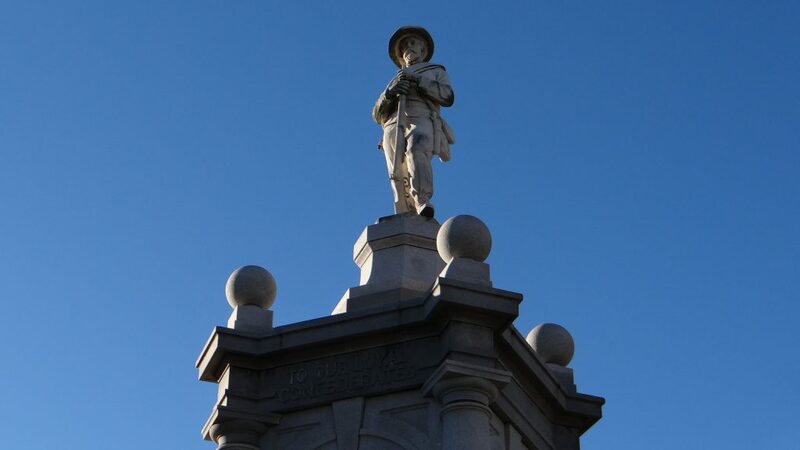 It also has a lot of Confederate state connections including a statue that has managed to survive the current fad to take them all down. 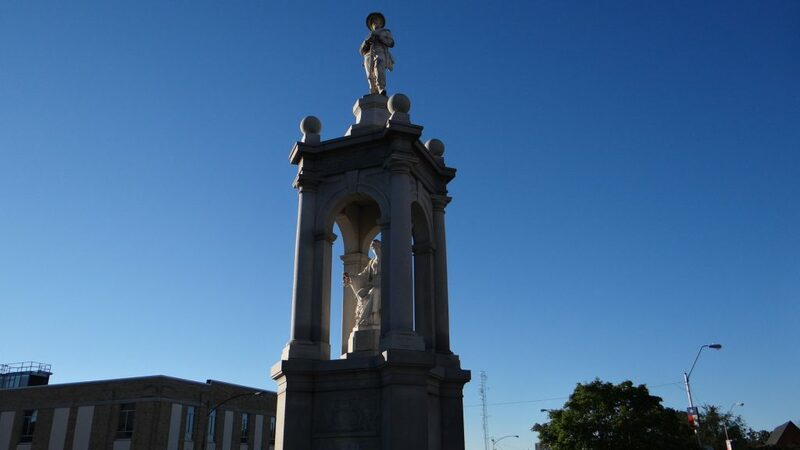 The statue commemorates all the soldiers that fought for the Confederate states. 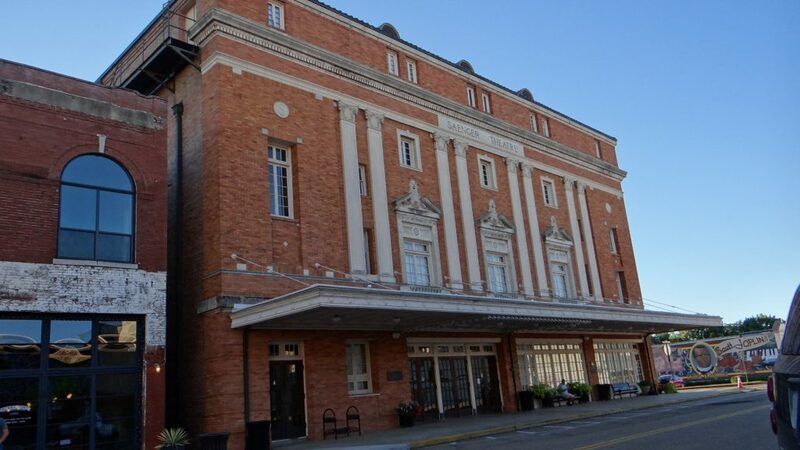 This is the Saenger Theatre one of the Theatres of the Julian and Abe Saenger’s theatre empire, which built a lot of the early movie theatres. Nowadays it is used as theatre and does not show movies. 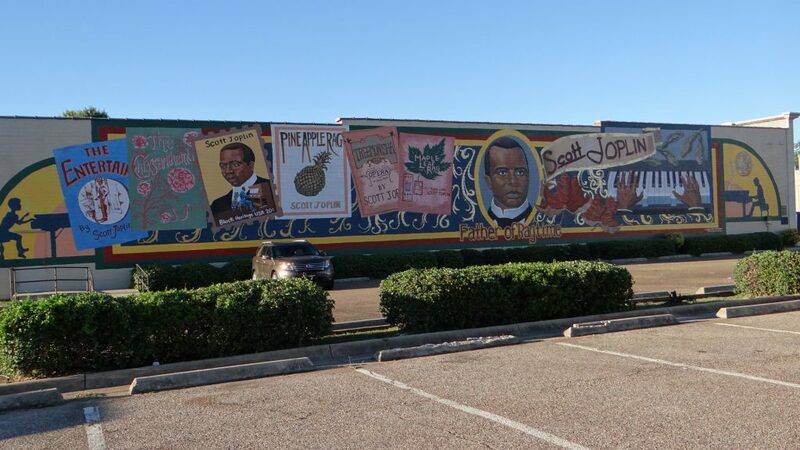 We then moved on to Shreveport. We had a day of rest here so we went into Shreveport to a Mall that was recommended. 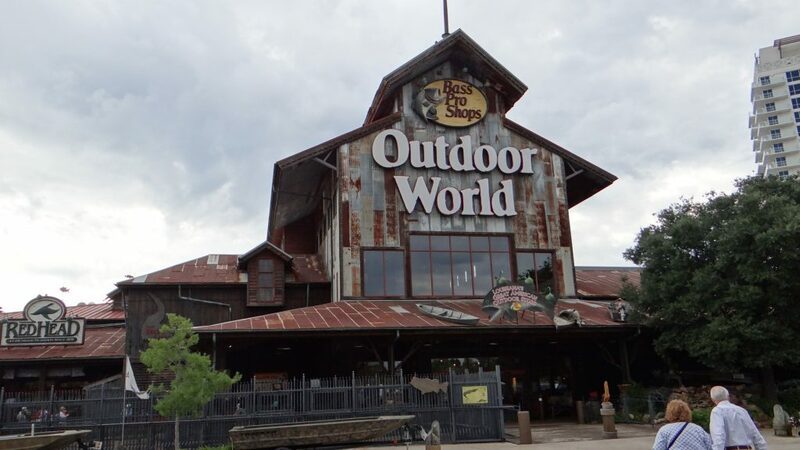 It had a massive Bass Pro Shops Outdoor World shop where you could buy anything you wanted to go hunting, shooting and fishing, from boats to guns and anything in between. The outside of the shop. 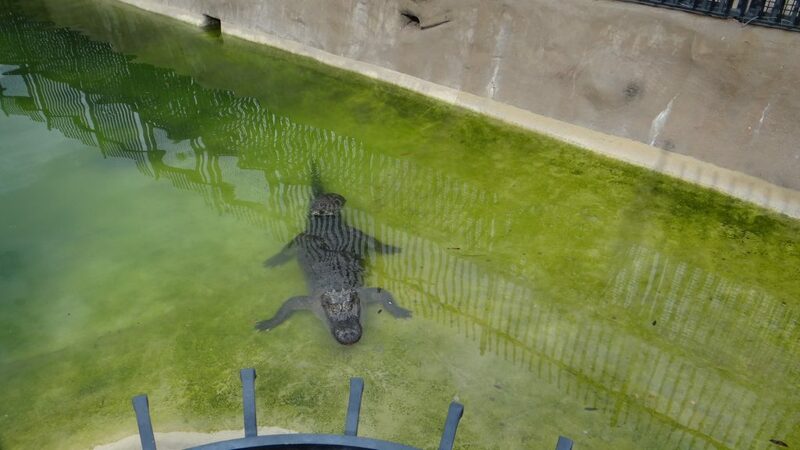 The cage at the front contained the alligators. Inside. The blue tank under the huge tree trunks was a massive fish tank containing at least one specimen of all the fish caught locally. 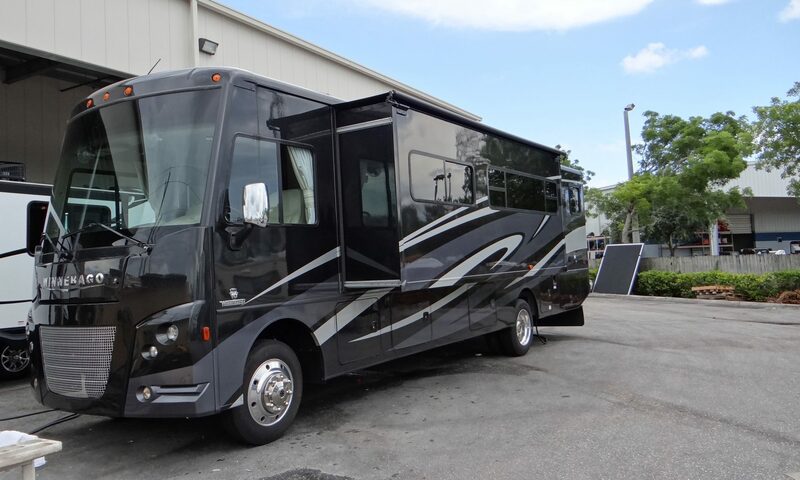 To the right is the upper floor. 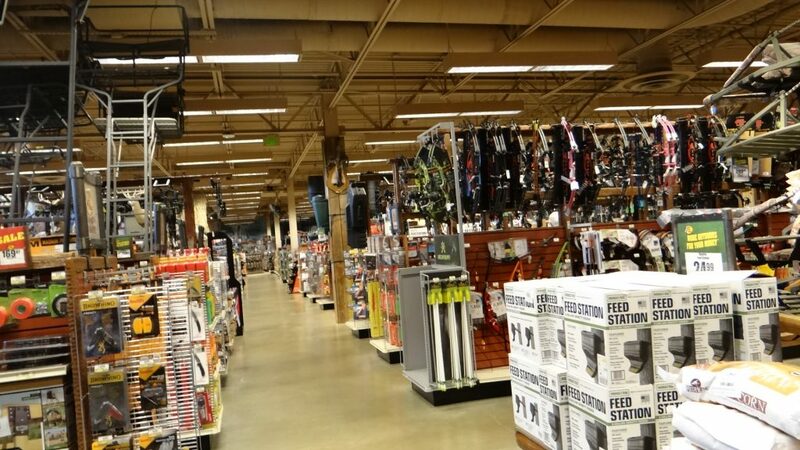 Guns, crossbows, bows, feed stations, you name it they have got it!! 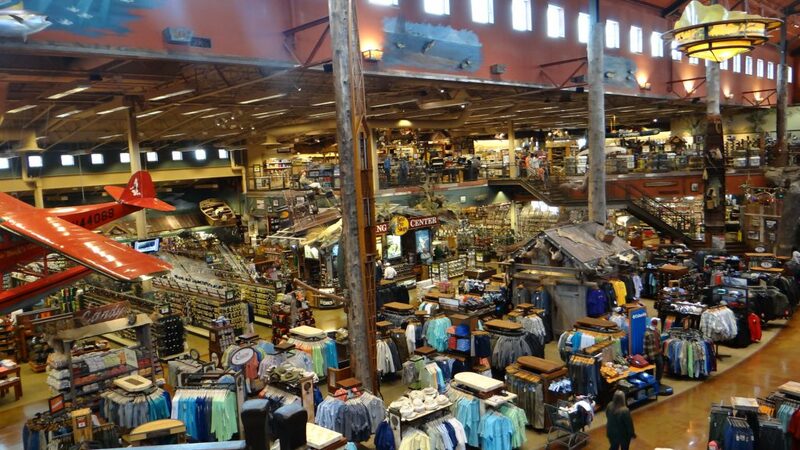 Clothing, seaplanes, boats, outboards …… the list was endless. 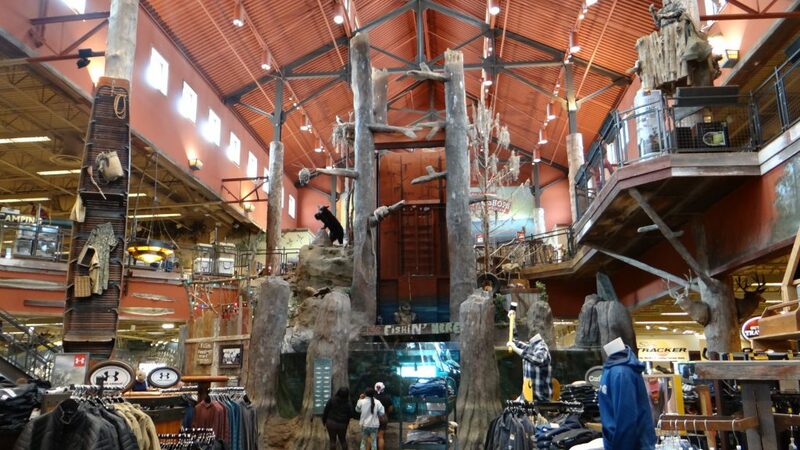 You could spend all day in this store just looking around or I could!! 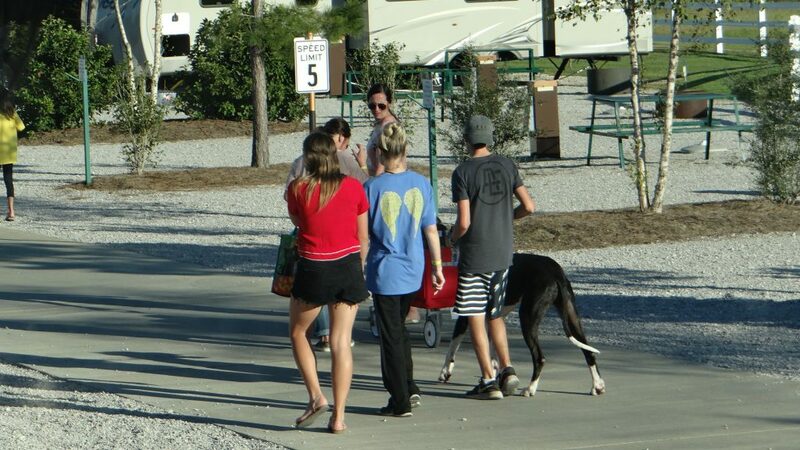 And our final stop before getting to New Orleans was Gator Grounds RV Park. 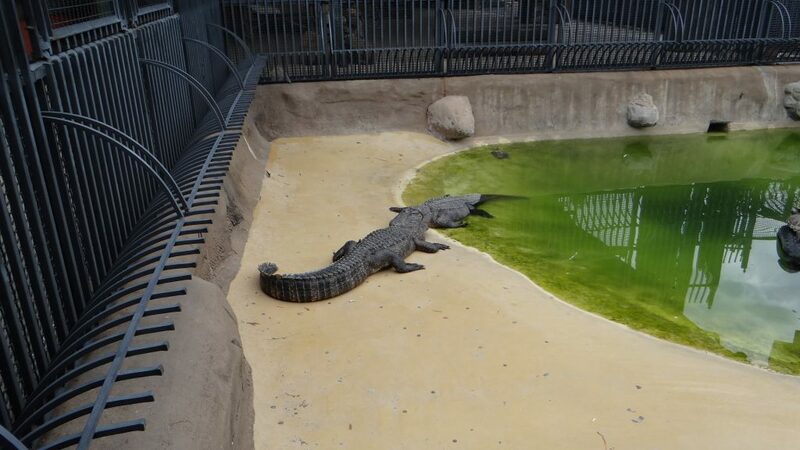 I had just booked it via Good Sams not realising it was a very child oriented park with water slides etc.. I suppose I should have realised when they asked me to make sure I was parked before 5pm as the campground roads would be closed from 5.30pm. Bearing in mind this was the 13th October, it turned out this was the first of 3 weekends that they celebrated Halloween!! 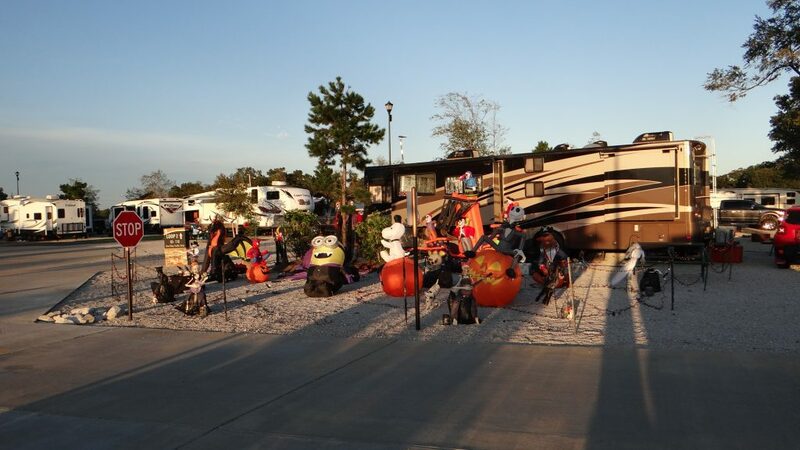 So we got in parked up and there were some spectacular decorated RVs. 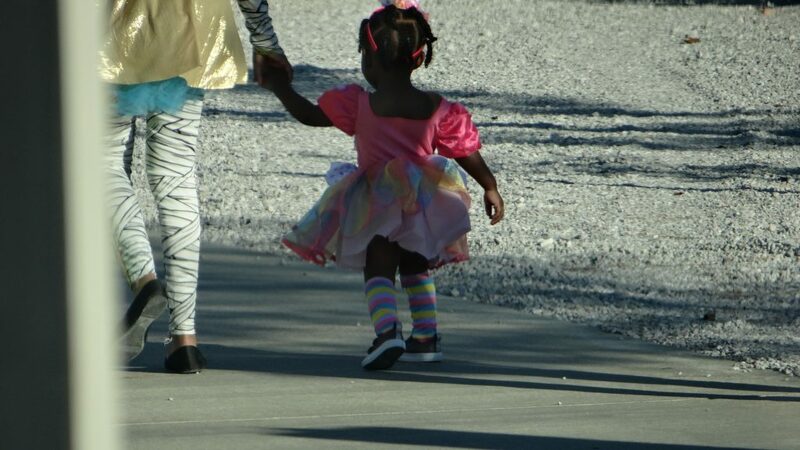 And then the “Trick or Treat” procession. I had actually gone out and bought some sweets in case our door was knocked on. 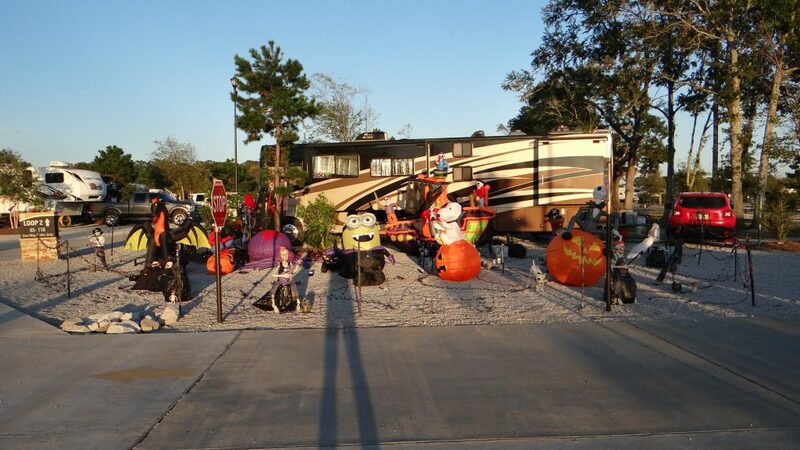 But what we didn’t know was the protocol said “only knock on the doors of decorated RVs or ones with pumpkins outside” and we had neither!! Mum and daughter all dressed up. A bull rider (the rope with bell on it is the giveaway) with a huge sack for sweets!! You can’t quite see but even the pets were dressed up!! 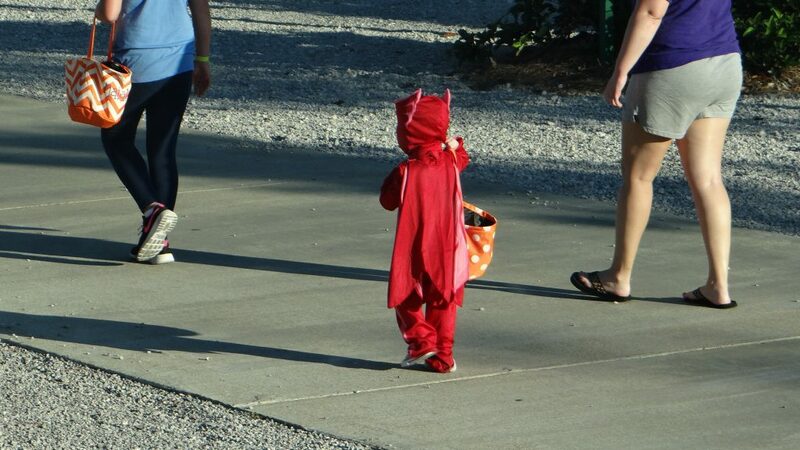 A little devil with his sweet bag!! 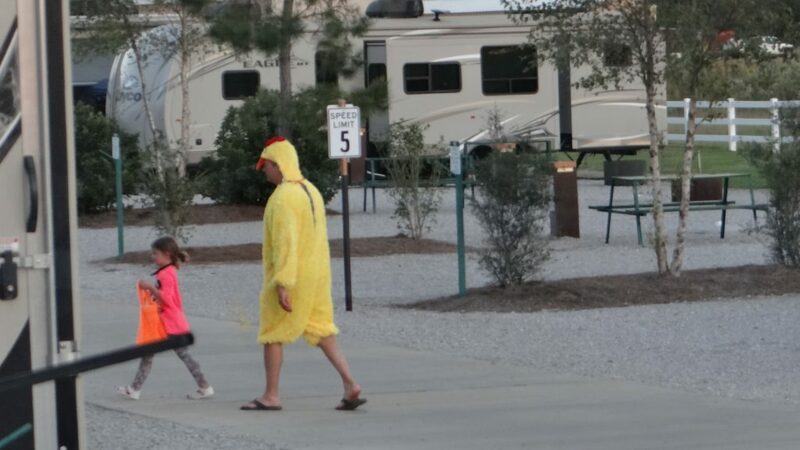 Dad dressed up as a chicken!! 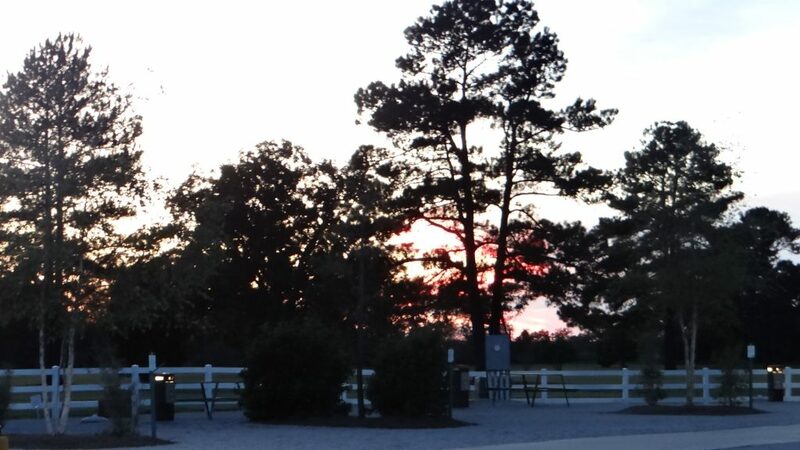 It was an interesting evening finished by a magnificent sunset. The next day we arrived in New Orleans to pick up Kathy and Anne from the airport on the 15th October. Bryce Canyon and Zion National Parks. admin on Into Oregon, Chiloquin and Klamath Falls and Crater Lake. Katharina Davitt on Into Oregon, Chiloquin and Klamath Falls and Crater Lake.